Don’t cry…don’t cry..don’t cry…ok bawling. The other day, Mike Modano announced his retirement from the NHL. This surprised no one, as it really is time for him to go. That doesn’t mean it hurts any less. With Mo’s retirement, the league loses a classy, talented, truly special player. At the same time, though, the Stars gain back a treasured family member. And of course it will end where it all started: with the North Stars/Stars francise. Today GM Joe announced that we would sign Mo to a one-day contract this Friday so our beloved number 9 could retire on his team. Frisco, Tex. – Stars General Manager Joe Nieuwendyk announced today that the NHL club will sign center Mike Modano to an official NHL contract, giving him the opportunity to officially retire as a Dallas Star. 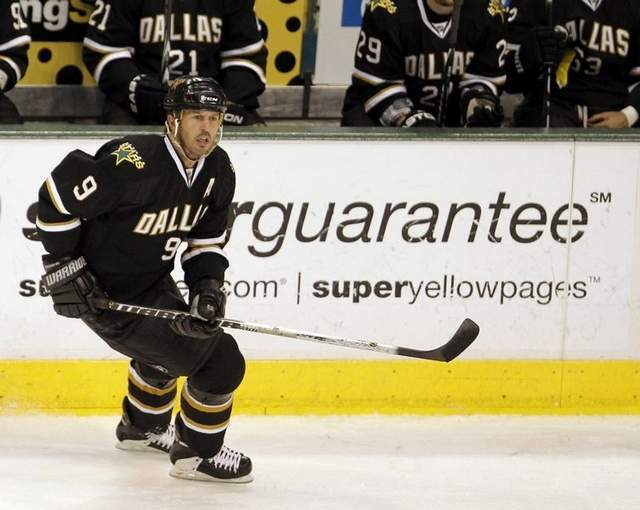 Modano will sign the contract at Friday’s press conference. Afterwards, he will send in his retirement paperwork to the National Hockey League. Full information on the press conference is listed below. The amount listed on the contract will be $999,999 in honor of his No. 9. My favorite part is the $999,999 in honor of the great number 9. It’s beautiful, absolutely beautiful. Now that the final North Star has decided to hang up the skates, all that’s left to say is a resounding thank you to the one and only Mike Modano. This entry was posted in Mike Modano, Uncategorized. Bookmark the permalink.